(Tokyo) In recognition of extraordinary contribution to help promoting baseball and softball on global basis over the years, IBAF at its Congress in Tokyo on April 14, 2013 presented Special Award to the Japan International Cooperation Agency, JICA. 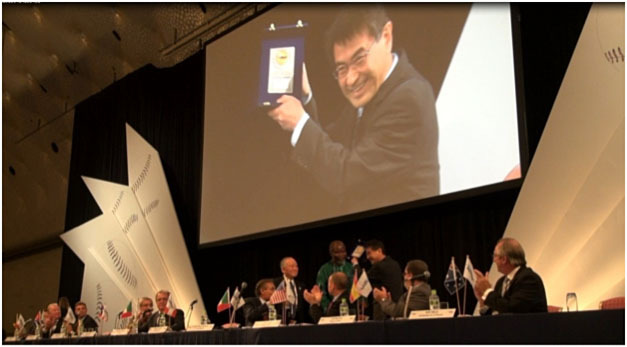 Ishola Williams (Nigeria), IBAF Continental Vice President representing Africa, handed a plaque to JICA’s Vice President Tsuneo Kurokawa in front of the delegates from over 70 countries/regions as well as Executive Committee members. On top of the JICA’s program, Japan’s Foreign Ministry supervises funding to build baseball ground in Sri Lanka (opened last December) and two projects are underway in Uganda (started work last February for inauguration next November) and Ghana (Grant contract was signed on February 1st). He pledged JICA’s commitment of its continued efforts for the betterment of the world through promotion of sports such as baseball and softball and wanted to share the joy of the Award with the volunteer coaches and many other people who have helped JICA’s initiatives.